Two firefighters injured after a fire broke out Thursday at the old Champion manufacturing plant near Jim Christian Road. 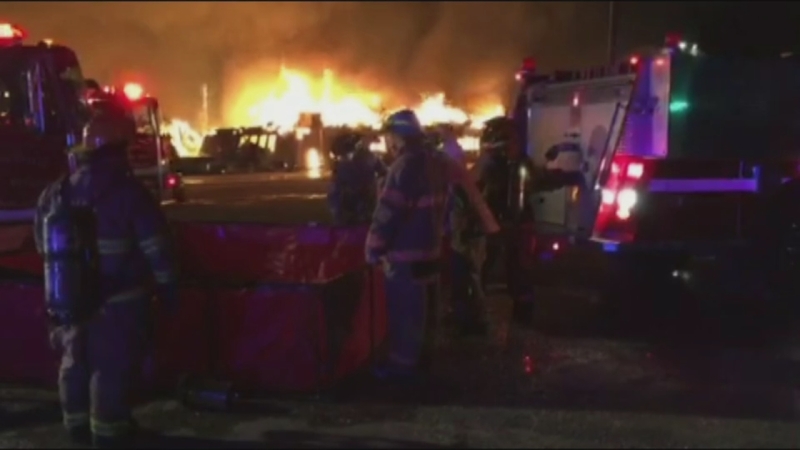 LILLINGTON, N.C. (WTVD) -- A massive fire in Harnett County Thursday night consumed an entire warehouse and injured two firefighters. The fire, which lit up the night sky for miles, broke out around 8:30 p.m. at the old Champion mobile home manufacturing plant on Jim Christian Road in Lillington. Click here for raw video from the scene. A fire broke out around 8:30 p.m. Thursday at the old Champion manufacturing plant near Jim Christian Road. More recently, the plant, which was longer than a football field, had been used to make and store wooden pallets, which added fuel to the fire. "There was a couple of big booms from the propane tanks they keep for the forklifts and stuff," said eyewitness Hunter Mullins. "It was a sight to see." Firefighters were still on the scene Friday morning battling the blaze, which sent flames hundreds of feet into the air. Finally, officials decided to let the fire burn out. "The hardest part was getting surrounding water sources and get everything organized to it where we can actually get around collapse issues and things of that nature," said Summerville Asst. Fire Chief Bodie Currin. Images from Chopper11 HD at daylight Friday showed the building was completely destroyed and still had smoke billowing from the rubble. "It's real shocking to wake up one morning thinking you're going to work and then you ain't got no place to work now [sic]." Brandon McLenan told ABC11 Friday morning after showing up to work. "The officer stopped me and said there's no more plant. It's hard times and this just made it harder for us." Meanwhile, the firefighters who were hurt only suffered minor injuries. Officials with the county said the property was owned by RGC Inc (Rick Gilchrest Company), and they were leasing it out to another company called Sandhills Consolidated Services.